Whether you are looking to brighten up your child's bedroom or nursery or have a special event such as a birthday party or Christening which needs that special piece of décor, we are sure you can find something here to suit your theme and really bring that WOW! factor to your walls. All flags are double sided and measure 6x7". You can choose the length you require by choosing from the dropdown menu on the Etsy listing. 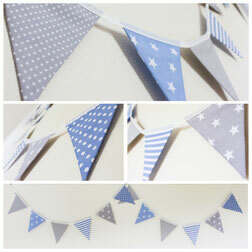 Beautifully soft pastel blue and grey bunting which will perfectly compliment your little one's nursery. Featuring polka dots, spots, stripes and star patterns. 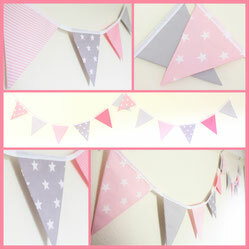 Beautifully soft pastel pink and grey bunting which will perfectly compliment your little one's nursery. Featuring polka dots, stripes and star patterns. Quality double sided flags each showing a variety of pirate themed images including pirates, ships, sharks, skull & crossbones, treasure chests etc. 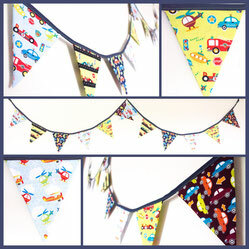 Fabulous bunting featuring a variety of vehicles such as racing cars, police cars, fire engines, helicopters, planes and more. 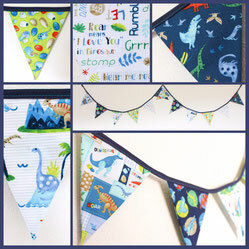 Prehistoric bunting in blue and green colours showing all the favourite dinosaurs, eggs, volcanoes and cute text. Just perfect for any wannabe soldier. 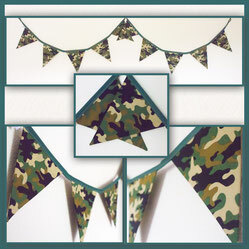 This woodland camouflage bunting would look fab in any military enthusiast's bedroom or hideout. 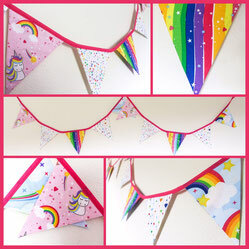 Bright pink and funky unicorns, rainbows, hearts & stars. 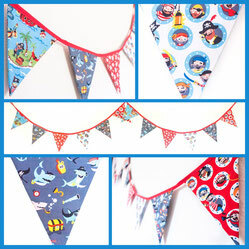 This bunting is a little girl's dream. 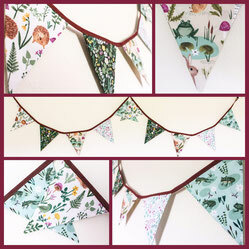 So many cute woodland delights are featured in this bunting. Prickly hedgehogs, leaping frogs, fluffy rabbits, squirrels, tortoises and more! Choose your length and binding colour. We sometimes have more stock available other than what is shown above. To see all items that are available to buy right now please head over to our Etsy Shop.